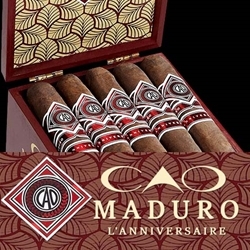 Produced at the CAO's factory in Nicaragua, every CAO L'Anniversaire Maduro hand-rolled premium cigar is wrapped in a rich and dark Connecticut Broadleaf that has been fermented under extreme heat for three months. Infused with an Ecuardoran binder with Dominican and Nicaraguan fillers, CAO Maduro cigars are medium-full body producing a smooth and strong smoke that consists of robust, earthy flavors with a touch of cinnamon. Each of these premium cigars are offered in a boxed-pressed style and come in boxes of 20 cigars. The CAO Maduro is a premium line handmade cigar offered at an everyday smoker's price, affordable and available to cigar connoisseurs everywhere! Try the one of the varieties of sizes and flavors listed below at our online cigar store. Each of these styles are in stock today at a low discount price! Call us for more details!